On May 3rd, pig will reign supreme on 5th Avenue. Vegans need not apply. Get ready to cook -- or eat. Here's what the organizers of May 3rd's Pork-Off have to say about their event: "Cook a big recipe with pork in it. The people will eat it, and the people will vote." Sounds simple enough. But you can't underestimate the combined power of pork and competition. Add the Brooklyn element to the mix, and stuff's bound to get eight kinds of crazy -- surely you haven't forgotten the bacon cupcakes at last month's Bacon Takedown, which also featured bacon sloppy joes and bacon ice cream. 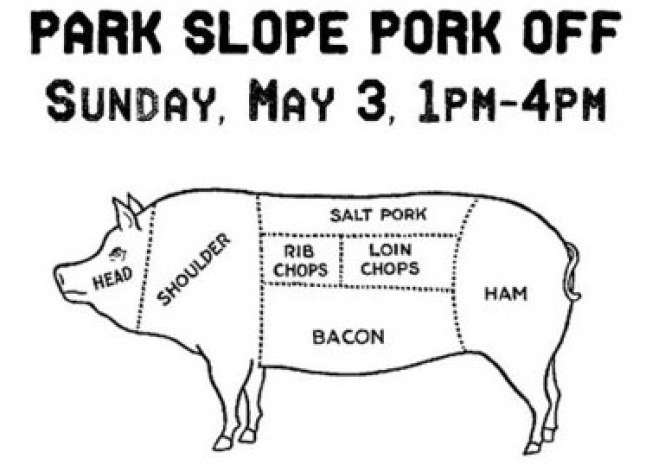 The Pork-Off goes down at 5th Avenue's low-key Loki Lounge on Sunday, May 3 at 1PM. If you think your pig dish is trophy-worthy, email your recipe to the organizers toot sweet -- first prize nets $50 and pork-off bragging rights. Or you can pay $10 to be a judge and stuff your porkhole with delicious samples (and wash them down with some of the 718-brewed suds on tap). More details at the Pork-Off's Tumblr page, including how to enter.